Protesters gather outside DeVos speaking engagement. 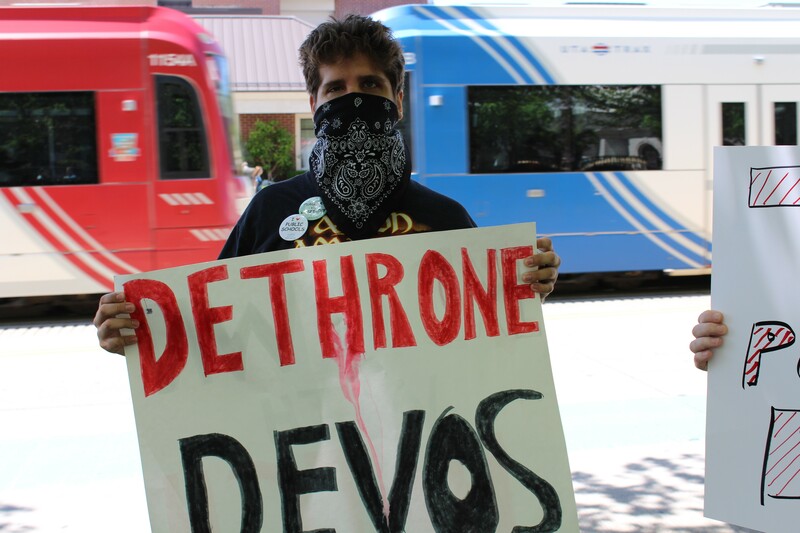 SLC denizens gave a warm welcome to DeVos on Tuesday. But for the kindness of a teacher, Layne Arguello might not have graduated from high school last year. Around January 2016, an educator at Ben Lomond High School gave the teen a roof when he faced homelessness, Arguello said, which allowed him to focus on school and go on to earn a diploma. The Ogden-based graduate shared his story at a rally Tuesday afternoon—National Teachers Day, coincidentally—in front of the Grand America Hotel where 100 people showed up to protest Education Secretary Betsy DeVos, who was invited to speak at an education and technology seminar. Arguello defended teachers and public schools while attacking DeVos’ lack of experience in the education system. “I think our teachers deserve better, I think our kids deserve better and I think public education deserves better than that,” Arguello said. 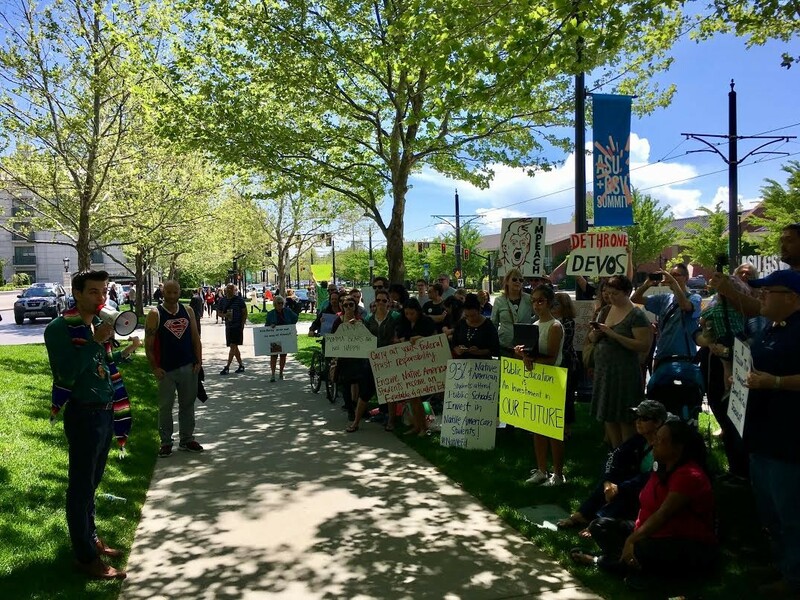 Utah Indivisible and Utahns Speak Out organized the protest, a continuation of an event held at the Wallace F. Bennett Federal Building during DeVos’ confirmation hearing. Utah Indivisible co-founder Kellie Henderson said the action was primarily a message to DeVos herself. DeVos is considered by some to be President Donald Trump’s most controversial cabinet appointee based on her advocacy for school choice, which is often considered a covert strike against public education. Henderson also pointed to DeVos’ position favoring debt collectors over students as a sign that she doesn’t have educational interests at heart. At the rally, protesters were asked to remain on a shady strip of grass between the sidewalk and Main Street. Demonstrators carried a variety of signs including one that mocked DeVos’ bewildering comment that guns in schools could protect students from grizzly bears. “One of these is a threat to our school students, the other is a bear,” read the sign, which was plastered with a photo of DeVos and a snarling grizzly. Security at the hotel rebuffed any entrance inside the building except to guests with conference passes. Joél-Léhi Organista addresses the crowd. A health teacher at an alternative high school, Joél-Léhi Organista was one educator who shared his concerns of DeVos’ revealing résumé. Education is one of several federal departments that politicians regularly offered up on the chopping block. This year, Rep. Thomas Massie, R-Kentucky, sponsored a one-sentence bill that called for the elimination of the Education Department by the end of 2018. Organista argued that such thinking is shortsighted.